Investigate everything from cells to crystals! 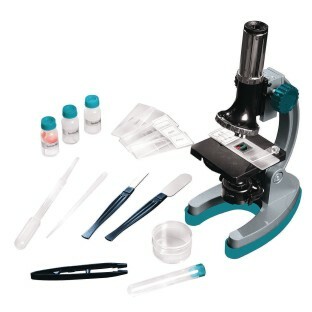 MicroPro™ 48-Piece Microscope set enables kids to investigate everything from cells to crystals! This set features glass eyepieces and power settings from 50x to 600x for superior precision viewing. Includes die-cast metal microscope, 10x and 20x glass eyepieces; 3 prepared slides, 8 blank slides, lab supplies, 18-page instruction and activity guide. Light requires 2 “AA” batteries (not included).